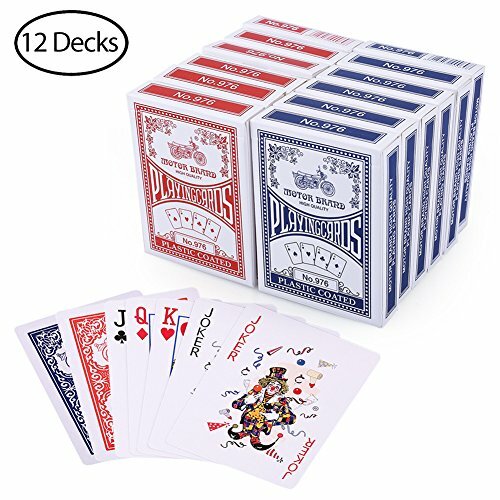 Playing cards are one of favorite items for party, travel and camping to kill time with friends and family. Whatever play poker, bridge, euchre, hearts, go fish, blackjack, baccarat, or other different variations of solitaire, a dozen decks of playing cards can satisfy all your needs. Our decks of cards are made from paper, coated with a layer of plastic, to make slick, durable and easy to shuffle. The wide size is sometimes called poker size, it measures 2.5" x 3.5" (63mm x 88mm). Our standard playing cards feature classic red and black suits, traditional face cards and regular index. We have red and blue cardbacks, 6 of each color. Each deck contains 52 suited cards and 2 jokers. Poker size with standard index: cards measure 2.5" x 3.5"
If you have any questions about this product by LotFancy, contact us by completing and submitting the form below. If you are looking for a specif part number, please include it with your message.